Mouse anti V5-Tag antibody, clone SV5-Pk3 recognizes a small epitope, termed Pk, present on the P/V proteins of the paramyxovirus, SV5. 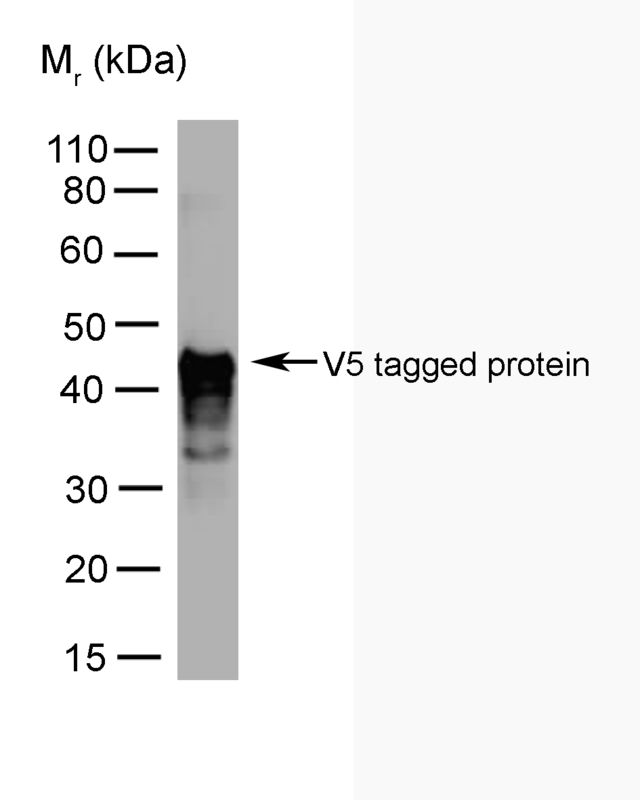 Mouse anti V5-Tag antibody, clone SV5-Pk3 has been used to detect recombinant proteins, some of which include transmembrane and secreted proteins, which have been tagged with this epitope. Usually, a 14 amino acid tag has been added to the recombinant proteins, although a smaller epitope of 9 amino acids (that as a peptide inhibit the binding of the monoclonal antibody to its native protein) has also been successfully used. The 14 amino acid epitope is; gly lys pro ile pro asn pro leu leu gly leu asp ser thr. (The 9 amino acid epitope is underlined).